I am SO excited about all the new things at Crossroads! One of the most exciting is the upgrade of the Coffee House! 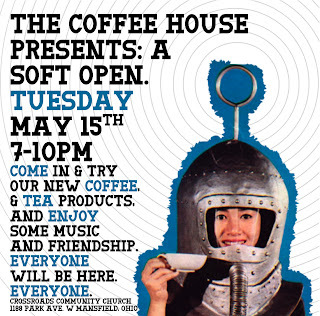 All you young adults out there - PLEASE join us at Crossroads next Tuesday night in the Coffee House for a 'soft open'! There will be all your favorite speciality coffees and amazing brand new teas available for purchase! Come bring computers, a good book, a deck of cards or just you and your friends - and hang out next Tuesday evening at Crossroads Coffee House - 1188 Park Avenue West, from 7:00 - 10:00. There will be some live acoustic music and EVERYONE will be there! EVERYONE! !